What is the biggest challenge you’re facing in your professional life? 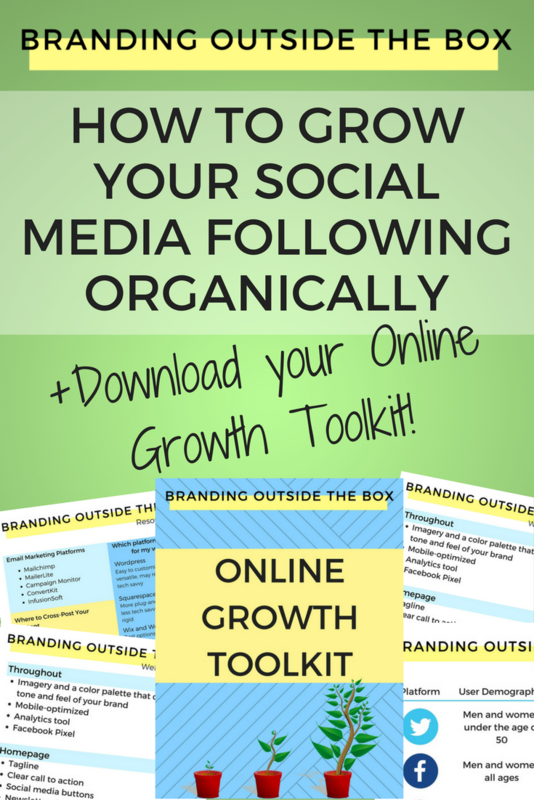 There were a number of options, but “Growing my online following” received exponentially more responses. I asked, you answered, and now it’s time to give you what you want! 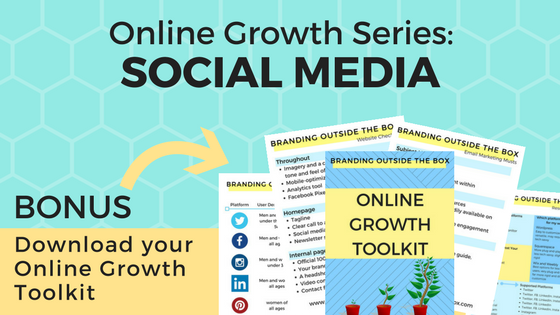 The final piece of the online growth puzzle is social media, and in my experience, it’s the piece that confuses people the most. You know you need to have a social media presence, you know the mechanics of sharing a photo to Instagram and re-tweeting, but two things often remain unclear. First, what do you post, and second, how do you get people to pay attention? If you’ve been reading the blog, you know by now that I advocate for leading with good content. It’s important to refer back to your content strategy whenever you’re creating social media content to ensure that what you’re posting is on-brand and will attract your target audience. But when it comes to growing your following, I no longer have a completely, “If you tweet it, they will come” view. As Facebook and Instagram change their algorithms regularly and Twitter is so saturated that your content is only seen by a small fraction of your followers, it takes far more to attract new social media followers than it used to. Strong, compelling content will keep your audience engaged, but it doesn’t matter if they never see that content in the first place. Entire books have been written on social media strategy and, so it’s impossible to cover all aspects and nuisances of each platform in a single blog post. However, there are a few key aspects to each platform that will help expose you to a new audience and attract the followers you want. Facebook is by far the largest social media platform in the world, and for the majority of people, it’s the most crucial for establishing their brand and boosting their sales. But as a page – whether you’re a business or a public figure – it often feels like the only way to get new followers is through ads. That’s not true. While it’s a bit more time consuming, it is possible to cultivate an audience organically, and I’d argue that this audience will be far more engaged than anyone you target through advertising. Like other pages as your page. These pages can be other businesses in your neighborhood, businesses or people with similar audiences, media outlets you hope will cover your product, partners or vendors you work with, and other organizations you want to associate yourself with. Comment on their content. Not only will this build your relationship, it will also increase your exposure to their audience. When you post photos, tag your location, the people in the photo, and any products you’re featuring. This increases the chances of them sharing your photo to their page and you reaching a new audience. If you have both a personal profile and a public page, don’t be afraid to invite people to like your page. Don’t expect everyone to accept the request, but making a habit of inviting new friends to like your page can increase followers over time. One last Facebook trick that I learned from Andrew Hubbard is a way to increase followers in conjunction with your ads, but without paying for them. It’s so simple, easy, and yet, often overlooked. You can view his demo here. Post 3-5 times a day, re-posting important content at different times of the day. People who are online at 7am aren’t the same people only at 2pm, and if you have an international following, time zones are a big consideration. Posting the same links multiple times per week ensures that nearly all of your followers will actually see them. And don’t be afraid to re-post older content. If you’re working to grow your following, your new followers haven’t seen it! Engage with other users a few times a day. This can be as simple as re-tweeting their content, or @ replying to one of their tweets. And whenever you link or mention other people’s content, don’t forget to tag them in your post. Avoid over-using hashtags. Text is searchable on Twitter, so if people are looking for content about “marketing” or “weddings,” you don’t need to add hashtags in order for them to find your tweets. Instead, utilize existing and trending hashtags to increase discoverability. If you share a blog post about nailing a job interview, you can add #careertips or #careeradvice, but don’t feel the need to add hashtags to #job or #interview. It looks spammy. Instagram users are growing rapidly and so many people I know are shifting their focus there. The visual platform is great for showcasing products or giving followers insight into your personality, but it may be difficult to grow a following quickly. It can be tempting to run bots or buy followers, but please avoid the temptation as this could alter the algorithms and hinder your organic growth. Though it may might feel frustrating when you’re only gaining a few followers a week, keep in mind: it’s more important to gain quality followers that will engage with your content. Include 7-10 hashtags with every post. Unlike twitter, most Instagram text isn’t searchable, so it’s necessary to tag your photos to increase your discoverability. These labels can be somewhat generic (#fitness, #weddings, etc.) but the more specific you are, the more likely you’ll reach your target audience. If you’re a nutritionist, your target audience will most likely be searching for things like #recipes #lowcaldiet or #weightloss. If you’re a virtual assistant, your ideal client may be searching for things like #productivity or #worklifebalance. Put yourself in the head of your ideal client, understand what they’re looking for, and post content catered to them. Engage with other users on a regular basis. Search hashtags, find relevant content, and comment on that post. Even if you’re not following the person, if you seem interesting, that user may follow you back. If you’re looking to go more in-depth and really focus on Instagram growth, I recommend checking out Social Insight’s Growth Bootcamp. I’ve been implementing their tactics for a few weeks now and have already attracted over 100 new followers. LinkedIn is a crucial platform for those of you climbing the corporate ladder or offering services for corporate clients. Growing an audience here is fairly easy; you send connection requests and hope they accept. But having a following isn’t enough; you need to have an engaged following. Share relevant content once a day, use relevant hashtags, and tag anyone or any organization you mention. This will ensure that your name and your content are getting in front of your connections regularly. If you blog, cross-publish your posts to LinkedIn. I do this regularly and am often surprised by how many more people will read the content on LinkedIn vs. the blog. I’ve also generated a handful of new business leads from having connections share my articles with their connections. Congratulate your network on new jobs or promotions. And this doesn’t mean just hitting the canned response generated by LinkedIn. Send a thoughtful message to ensure you make a true impression. Are there other social media platforms you’re currently focusing on? Need help growing your following there? Share those platforms in the comments and I can address them in an upcoming blog post or Facebook Live!